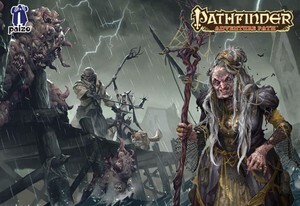 The "The Thrushmoor Terror" SoundPack gives you the complete audio solution when playing the second chapter of Pathfinder's "Strange Aeons". All the preparation is done for you and every sound you'll need is right at your fingertips. After escaping from the waking nightmare of Briarstone Asylum, the former captives venture to the dismal town of Thrushmoor to unravel the enigma of their lost memories. Upon arrival, the adventurers discover that the town’s leadership has either fled town or gone missing, and a rash of kidnappings and rumors of the Briarstone Witch spread terror through the people of Thrushmoor. As the adventurers investigate the unsettling mysteries, they uncover a secretive cult who plans to use Thrushmoor’s ancient monuments to grow their strength and power. Will the adventurers discover the secret to their affliction and find an answer in an uninviting town, or will they fall victim to the ruthless cult that wants to slay the people of Thrushmoor as a sacrifice? When did you last see us? Why is the fort locked? What about the missing people? Pathfinder Adventure Path: Strange Aeons, Thrushmoor Terror © 2016. Paizo Inc., the Paizo golem logo, Pathfinder, and Pathfinder Adventure Path are trademarks of Paizo Inc. Author: James Jacobs. SoundSet © 2016. Sounds created under license with Paizo Inc.